The short term (minimum 3 months) or long term rent of fully furnished modern flat of size 2+kk (approx. 45 m2) with balcony. Apartment consists of living room with equipped kitchenette, separate bedroom, bathroom with a shower and toilet, entrance hall and balcony. 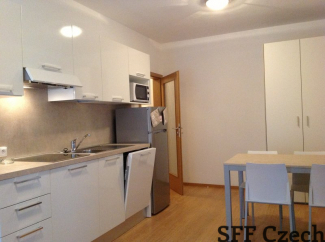 In the flat is also washing machine, dishwasher, microwave, dishes, satelitte TV with multi -languages programs. In the house with elevator is reception with security, possibility to rent a parking space, but also is possible park a the car easily outside on the street. Metro station Invalidovna (yellow line-B) in short walk distance from house. Metro station „Křižíkova“ only one stop away as well by tram. 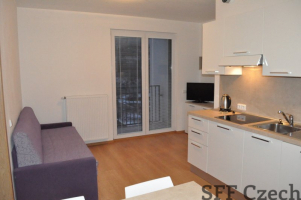 Very good access to the city center, only 3 stop stations by metro to Namesti Republiky, Praha 1 (5 minutes) or 4 stop stations by tram. Nearby supermarket Albert, Pizzeria, restaurants, caffe and more. The monthly rent for 1 person 21.500 CZK including all utilities, internet (for two persons 22.500 CZK). The owner requires security deposit equal to one and half month rent.